What Great Lakes is Cleveland on? Set into the beautiful Lorain County Metro Parks, True North Cultural Arts was the site of an exploration of themes present in Love’s Labour’s Lost, conducted by GLT Education Outreach Associate David Hansen. This Master Calss was presented as part of Great Lakes Theater's annual Surround educational programming. 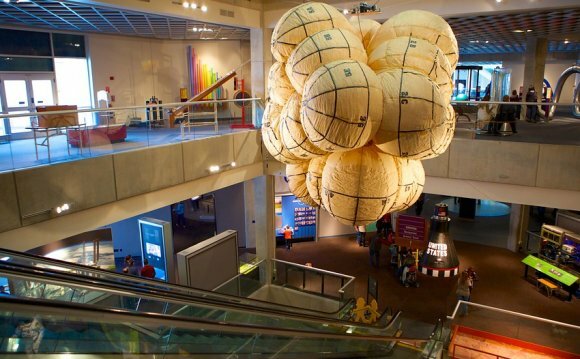 "Surround" is an umbrella term that refers to a series of free Great Lakes education programs designed to connect audiences to our spring productions. Participants read passages from Shakespeare’s text, playing the King of Navarre, the Princess of France, and their romance-stricken attendants. Scenework was accompanied discussions, theater exercises and an exploration of Shakespeare’s sonnets, thought by some to contain clues to the Bard’s inspiration for Love’s Labour’s Lost. 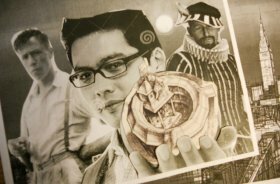 Over the next two months, these student artists will create original works inspired by their experiences in this special workshop event, and Shakespeare’s text. These works will be presented in an exhibition called Contemplative In Living Art (LLL I.i) in the Deloitte Room in the Hanna Theatre, opening April 8, 2016 - opening night of Great Lakes Theater’s production of Love’s Labour’s Lost! 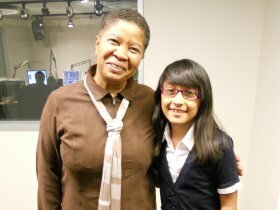 A Christmas Carol Writing Contest Grand Prize Winner Brenda Gomez (Douglas MacArthur Girls' Leadership Academy, 8th Grade) with WCPN's Dee Perry. Brenda Gomez (with Dee Perry) in 2013. 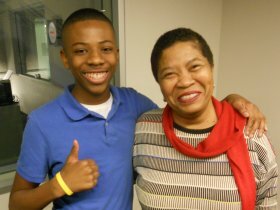 A Christmas Carol Writing Contest Grand Prize Winner Donovan Reed (Whitney M. Young Talented & Gifted Academy, 7th Grade) with WCPN's Dee Perry. Donovan Reed (with Dee Perry) in 2014. This year, we have TWO previous grand prize winners in Great Lakes Theater’s annual “A Christmas Carol” Writing Contest! The Christmas Carol Writing Contest is a literacy program open to all Cleveland Metropolitan School District (CMSD) students in grades six, seven and eight. Every year since 1989 students participate by writing original stories, songs and poems inspired by the timeless themes in Dickens classic tale. Donovan Reed (Whitney M. Young Talented & Gift Academy, 7th Grade) was a 2014 winner. Donovan’s entry this year, The Misbehaved Christmas, introduces an intolerable boy named Jack, who has never known the consequences of his selfish actions. Brenda Gomez (Douglas MacArthur Girl’s Leadership Academy, 8th Grade) was a 2013 winner. With this year’s entry, The Winter Storm, Brenda spins a fantastic story where Ebenezer Scrooge is haunted by a girl with burning green eyes. These two and the other four of this year’s grand prize winning stories will be read by GLT’s “A Christmas Carol” acting company members for broadcast on WCPN’s “Sound of Applause” hosted by Dee Perry on Monday, December 7 at 2:00 PM and 10:00 PM. Listen in to 90.3 FM ideastream or wcpn.org! On Tuesday, April 28, two award-winning Lorain County Community College student playwrights, their peers and members of their family gathered in the Cirigliano Stocker Arts Center Studio Theatre for a script-in-hand performance of their ten-minute plays. 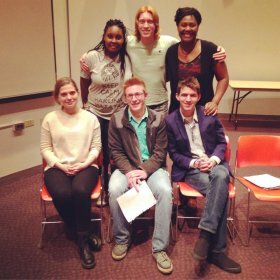 Actors from the Great Lakes Theater school residency program and outreach tours performed The Party Guest by Billy Hopp and The Sisters Mourn by KHR Capizzi, which were the Second and First Place winners (respectively) for the 2015 Lorain County Community College Playwriting Contest. This event was the culmination of Dr. Daniel Cleary’s ENGL/THTR 168: Playwriting for Stage and Screen Course, incorporating themes from William Shakespeare’s The Tempest. In The Party Guest, several close friends reveal deeply held secrets and celebrate new freedom after the arrival of an unannounced stranger. The Sisters Mourn details the effect their mother's death has on three sisters, and how their sorrow affects each differently. Each piece reflected themes of deception and loss present in Shakespeare’s timeless work. GLT performers included Luke Brett, Chelsea Cannon, Roderick Cardwell, Katelyn Cornelius, Chenelle Bryant-Harris, Tim Keo, Shaun O'Neill, and Michael Silverstein, and the event was staged by David Hansen, GLT Education Outreach Associate. Special thanks to Jeremy K. Benjamin, LCCC Director of Theatre and to Professor Dave Cotton. The LCCC Playwriting Contest is part of GLT’s Surroundseries of free events presented across Northeast Ohio. On Thursday, April 16, six ten-minute plays were read by student actors from Professor Dave Cotton’s Acting for Theater classes, and evaluated by Northeast Ohio playwrights Christopher Johnston, Margaret Lynch, Eric Schmiedl, Michael Oatman and GLT Educational Outreach Associate David Hansen. The original concept: three people, three time periods...can we get Cleveland in there somewhere? 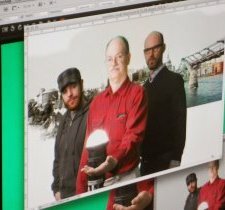 The team at TRG recreates the proposed image in front of a green screen. Stylist Kylee Cook prepares actor Arthur Chu for the shoot. 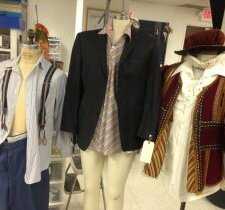 Costumes from GLT's stock are assembled and evaluated for style and color reference in preparation for the photo shoot. 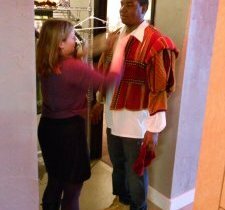 Costume designer Esther Haberlen pulled a variety of Elizabethan era garb from the GLT costume stock, and tries various collars on actor Kyle Carthens. Actor James Rankin is very happy with his stylish, Depression-era mustache. Actors gather on the "set" and prepare for their cues. This is one of dozens of possible images, from which TRG will create a composite final image. The duct tape is a temporary placeholder. The final image for THE GREAT GLOBE ITSELF.